The Upper Lee, County Cork, Ireland. Come June 2018 I will be graduating with the degree ‘BSc Biodiversity and Conservation’ from UCL, so it makes complete sense to me to script a post around that title! These musings will sit very snugly with an earlier post on the degradation of freshwater but here I want to focus in on the conservation strategies aiming to protect freshwater biodiversity, and highlight some real-life conservation in practice. A high level of biodiversity, the variety and spice of life (to a biologist like me anyway),is extremely favourable as it plays a key role in maintaining ecosystem resilience and stability. Ecosystem resilience was defined by Walker et al. (2004) as ‘the capacity of a system to absorb disturbance and reorganize while undergoing change so as to retain essentially the same function, structure, identity, and feedbacks’. It used to be assumed that planet Earth had a global steady state, having a ‘stable and infinitely resilient environment’. However, we now recognize that resilience can and has been destroyed and that taking the self-repairing mechanisms of ecosystems for granted is a mindset of the past.
. The Global Living Planet Index (LPI) is a biodiversity measure created and collated by the World Wildlife Fund (WWF) for the Living Planet Report 2016. These global LPI figures are based on scientific data of 14,152 populations of 3,706 vertebrate species (which includes fishes, amphibians, mammals, birds, reptiles), monitored between 1970 and 2012. This figure highlight the immense pressure freshwater biodiversity is under, with a much higher decline rate than terrestrial and marine rates. The production of food (predominantly by large-scale commercial crop and animal agriculture) is one of the largest causes of biodiversity loss through habitat degradation, pollution, soil degradation and loss and the overexploitation of species including overfishing in freshwater and marine ecosystems. The classic vegan argument “It takes 1000 litres of water to produce 1 kg of grain but it takes 43,000 litres to produce 1 kg of beef!” springs to mind when thinking about food production, but with agriculture consuming almost 70% of fresh water globally, this should not be overlooked. Freshwater systems themselves, including our lovely river Lee, are impacted by each one of these issues: food production; habitat degradation; water pollution; soil loss; flow modification and invasion by foreign species amongst others. These major threats are deeply interconnected, which further exacerbates pressure on biodiversity loss in a cyclical and downward spiraling manner (see Fig 2).
. The interconnections of key threats to biodiversity loss in freshwater systems. As rightfully requested by an anonymous reader, addressing the future of river catchments and their biodiversity is imperative to the discussion stretching from source to sea. From where we stand today, and if attitudes and behaviours do not change towards an increased appreciation of the value of freshwater biodiversity, we will find ourselves in deep trouble. As can be seen in Fig 3., a downward trend in biodiversity is already apparent and shows no signs of stopping. Fig 3. 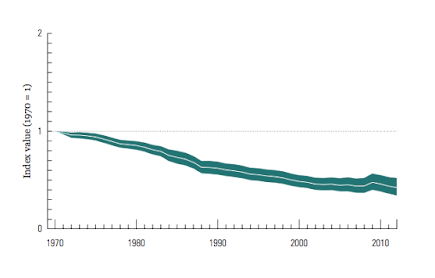 Global biodiversity has declined by 58% between 1970 and 2012. The white line is the index value whilst the shaded green areas depict the 95% confidence limits surrounding the trend. A fairly constant trend is apparent, with no indication of slowing down, let alone reversing. Source: WWFLiving Planet Reports 2016. Although some authors argue that no freshwater ecosystem has been spared the permanent fingerprint of man, there still exist biodiversity hotspots in a relatively pristine condition which need immediate protection through the designation of protected areas. This should happen to ensure further degradation is prevented, and habitats close to their natural state are preserved. Such protection, and more generally any conservation of river systems requires a catchment-wide approach, which includes the riparian zone. Due to the drainage basin surrounding a river which water drains directly into, what happens to the basin will directly impact the river quality. In terrestrial systems, a ‘fortress conservation’ approach can be much more easily applied, by which an area is defined and boundaries are drawn. This approach cannot work for river segments embedded in unprotected catchment basins, and thus it is often the case that sensible local management of river biodiversity is impeded due to inaccessibility to the catchment area. The amalgamation of terrestrial and riverine environment protection could provide a solution to conservation managers. It is crucial that trade-offs are accepted between the conservation of nature and human-resource-use perspectives. At times conservation should trump tourism and recreational activities whilst at other times human needs will trump conservation - and so a compromise is struck and long-term sustainable water management becomes a more realistic goal. Finally, a critical component to conservation success is the improved communication by scientists on the value of freshwater biodiversity, in order to get the greatest number of stakeholders and policymakers fully understanding the depth of the issue. Getting local communities directly involved in the conservation of their local river or stream system is also a major way to highlight the importance of healthy systems, not to mention a way to build trust and cooperation between the locals and conservation scientists. A personal experience will usually go a lot further in motivating someone to change their behaviour than simply reading about it on a blog (even a great one 😉 ). By now you may have noticed my not-so-secret admiration for salmon, and once again they weave powerfully into the tale from source to sea in Ireland: The freshwater pearl mussel (Margaritifera margaritifera) is an endangered IUCN red list species, has lost 95% of its European population and is on the verge of extinction but still fights for survival in the Blackwater, a river flowing through Cork, Waterford and Kerry. The freshwater pearl mussel relies on our admiral hero Salmo salar and brown trout (Salmo trutta) as a host in its parasitic larval stage - the tiny juvenile mussels, called glochidia, must be inhaled by a host salmonid, where they attach to the fish's gills. This oxygen rich environment enables the growth and development of the mussels until finally, they are ready to drop off onto a clean and silt-free sand/gravel bed of a stream or river. The freshwater pearl mussel is seen as aflagship and keystone speciesfor aquatic nature conservation as the active conservation of it requires improvement of its habitat, which in effect will benefit the overall biodiversity of the stream or river system. Although still in decline, this species is the focus of European wide conservation projects and to my delight, these projects are ticking all four criteria I've highlighted above. First and foremost, 19 Special Areas of Conservation (SACs) have been designated in Ireland under the EC Habitats Directive to protect this species, creating strictly protected sites countrywide. Secondly, there is a catchment scale approach to its conservation, particularly necessary as any form of siltation from runoff will negatively impact the mussels' survival. 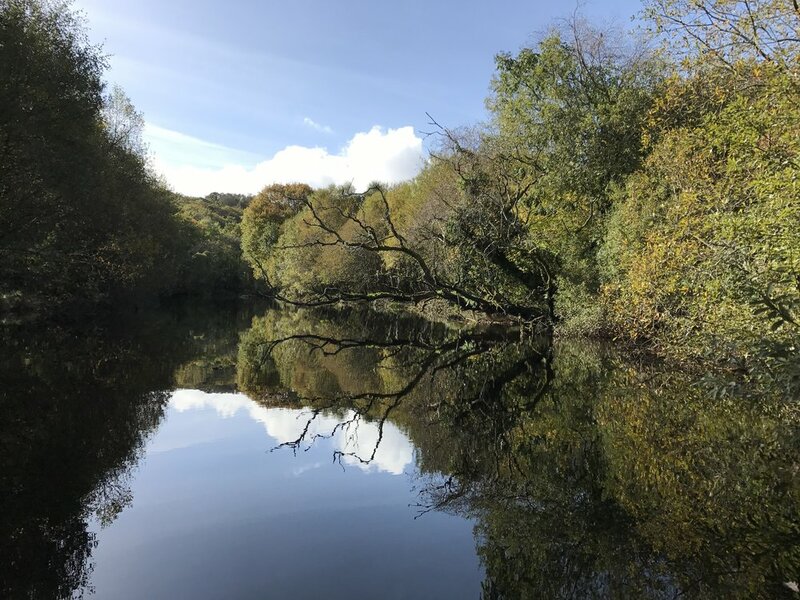 KerryLIFE, an example of such a project, is collaborating with farmers and forest-owners in the catchment area of the Blackwater to develop sustainable land management practices, aiming to benefit both the local community and the river system. Certain trade-offs will most likely need to be made, although KerryLIFE strives to minimize losses on either side as much as possible. Finally, this project is a great example of how flowing communication between key stakeholders (in this case the local landowners), scientists and governments can create conservation successes. The engagement with farmers and forest-owners allows for local knowledge and experience to be merged with science, in order to overcome hurdles and achieve conservation objectives. There are many habitat restoration practices which can be applied to aid in the conservation of this species, ultimately promoting high levels of biodiversity in a stream or river ecosystem (Fig 4. gives some examples) and many of these are already being applied in parts of Europe. Due to the long and complex life-span of this species, we must be patient before seeing results. So for the time being, let's be content with knowing that in this instance we humans are practicing not preaching real-life conservation. A Dangerous Truth About Salmon Farming: Where Does the Madness End?